The Snowy Day by Ezra Jack Keats is a classic winter read aloud great for preschool through early reader. In The Snowy Day, a boy named Peter explores the wintery wonderland created by fresh snow. The book won a Caldecott medal for it's wonderfully descriptive illustrations. You can read The Snowy Day free online at We Give Books. The pictures in The Snowy Day illustrate Peter's movements through the snow. As he moves, he makes tracks. He points his toes in and out to make his footprints form Vs. He drags a stick and creates a long straight line. He travels uphill and down in the deep snow. As I was reading this book with my boys, I began to think it would be a great text to use for teaching kids fine motor skills of making marks. Peter's movements could be practiced on paper as children made tracks and drew straight lines and curvy lines. 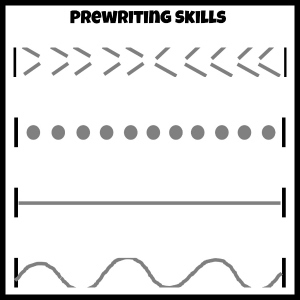 All of these fine motor skills are wonderful for preschool emergent writers. Children need to be able to make straight lines, curves, slants, and dots in order to create all of the letters in the English alphabet. I've even created a free printable for you to practice these. You can download this from my Teachers Pay Teachers store by clicking on the image or the link. I'd love if you'd follow for more freebies while you are there! In this activity, children will draw dashes as they copy Peter's movements of pointing his toes in and out. They will make dot footprints through the snow. Children will draw a straight line just as Peter trailed his stick to draw a line. And, students will trace a wavy line as they move up and down the snow drifts. 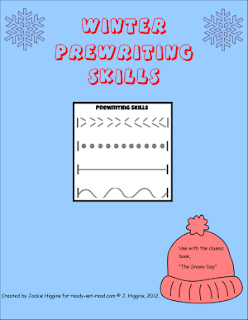 This printable can be used with the book, The Snowy Day but the book isn't necessary to complete the activity. You can use marker or crayon with this printable or you could even try snow paint. We practiced drawing these lines recently with snow paint. 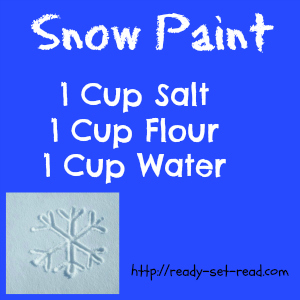 To make snow paint, combine equal parts salt, flour, and water. This paint dries and makes a white snow with a gritty texture that looks like snow! I would recommend printing the free printable on cardstock or a heavy paper if painting. 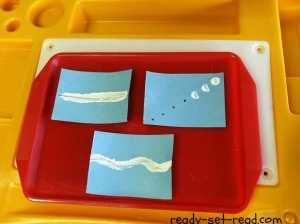 Enjoy The Snowy Day with your preschooler and sneak in some fine motor fun at the same time! This looks great! And I've never heard of snow paint. My boys will love it! Hello Jackie, so nice to visit your blog. I enjoyed looking at the pictures of Greg and your little ones. I would love to talk to Greg. He can find me at matthewpap [at] gmail [dot] com. Snow paint sounds fun. I hope we get more snow next week! justification appeared to be on the web the easiest thing to remember of. My boys aren't itty bitty anymore - but I think the snow paint idea is great for any age - we will definitely try it on our first BIG SNOW Day! I LOVE it! Wonderful new blog design! Happy, bubbly, and adorable like you! It fits so well. Great colors and design. I used to have my students have like an obstacle course for the Snowy Day, and each one acted it out while I read it. They love the story. Fun choice of books, as usually! Can't wait to try the snow paint. My girls have never seen the snow so I know they would get a kick out of it. We'll have to mix up some snow paint! Sounds cool!! Nod like how you used it for a tracing tray!! Hi! I found your snow paint recipe on Pinterest and my third graders are going to work on it with their first grade reading buddies. Can we use paintbrushes with the snow paint? And does the recipe make enough for just one child or could it be used with multiple kids? Last question- how fast does it set up (like should I make it right before we are going to use it)?